Today we look at fundraising by the Council District candidates. As with our prior posts on the County Executive and Council At-Large races, we start with a note on methodology. First, we calculate total raised and total spent across the entire cycle and not just over the course of one report period. Second, we separate self-funding from funds raised from others. Self-funding includes money from spouses. Third, for publicly financed candidates, we include public matching fund distributions that have been requested but not deposited in raised money and in the column entitled “Cash Balance With Requested Public Contributions.” That gives you a better idea of the true financial position of publicly financed campaigns. Let’s start with the Council District 1 candidates. Former Comptroller staffer Andrew Friedson is easily the fundraising leader. His total raised for the cycle ($333,081) exceeds any of the Council At-Large candidates and his cash on hand ($245,290) almost equals the cash on hand of the next three candidates combined ($251,205). Friedson has raised $159,257 from individuals in Bethesda, Chevy Chase, Glen Echo, Cabin John, Kensington, Potomac and Poolesville, which represents 48% of his take. That amount is not very different from the TOTAL fundraising from others reported by former Kensington Mayor Pete Fosselman ($174,996) and former Planning Board Member Meredith Wellington ($138,820). Of Friedson’s 1,074 contributions, 702 were for $150 or less. The endorsement leader in District 1 is Delegate Ana Sol Gutierrez, who has the support of MCEA, Casa in Action, SEIU Locals 500 and 32BJ, Progressive Maryland and MCGEO. But Gutierrez’s main base of voters is Wheaton, which is not in the district, and she does not have a lot of money for mail. Friedson got a big boost when the Post endorsed him. Reggie Oldak faces a cash crunch at the end because of her decision to participate in public financing. Unlike Friedson, Fosselman or Wellington, she can’t get big corporate or self-financed checks to catch up late and she has already received the maximum public matching funds available ($125,000). District 1 has by far more Democratic voters than any other district and past candidates, like incumbent Roger Berliner and former incumbent Howie Denis, raised comparable amounts to the at-large candidates. The next County Council should consider whether to adjust the matching funds cap to avoid handicapping future District 1 candidates who enroll in public financing. Now let’s look at the Council District 3 candidates. Incumbent Sidney Katz and challenger Ben Shnider have raised comparable amounts for the cycle. But Shnider’s burn rate has been much higher (partly driven by early mail) and Katz has more than twice his cash on hand. Katz’s strength is not simply his incumbency but the fact that he has been a county or municipal elected official in the district longer than Shnider has been alive. That shows up in their fundraising. Katz is in public financing and recently announced that he will receive the maximum public matching funds contribution of $125,000. Of Shnider’s $199,454 total raised, just $14,639 (7%) came from individuals in Rockville, Gaithersburg, Washington Grove, Derwood and zip codes 20878 and 20906. That is a huge gap in starting indigenous support that Shnider has to close. Here are the summaries for Council Districts 2, 4 and 5. Council District 5 challenger Kevin Harris qualified for public matching funds so he can send mail against incumbent Tom Hucker. But we expect Hucker and his fellow council incumbents, Craig Rice and Nancy Navarro, to be reelected. We’ve all felt the Montgomery County Squeeze. It’s the squeeze on families facing higher living and childcare costs despite stagnant wages, on commuters stuck in the second worst traffic congestion in the country, and on parents whose kids are squeezed in overcrowded schools. It’s the squeeze on young workers and new families who can no longer afford to live here, and on seniors struggling to maintain a quality home and a dignified livelihood without the support they need to get by. Montgomery County is a special place, but we can’t afford to ignore the change that’s happening all around us because it’s putting the squeeze on all of us. 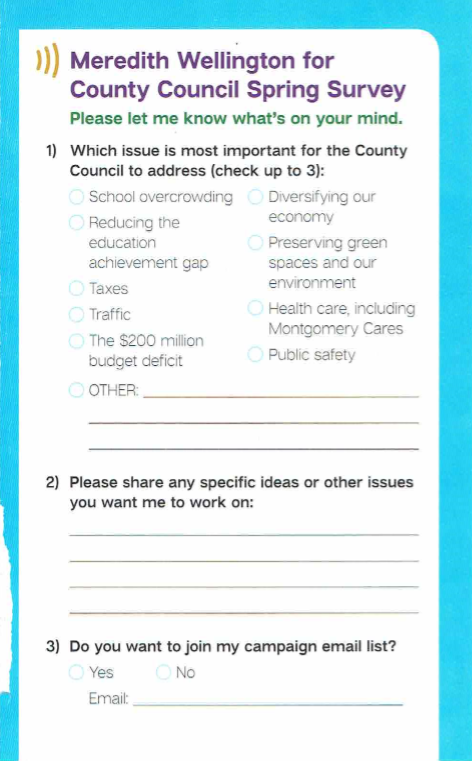 I’m running for County Council to Ease the Montgomery County Squeeze with forward-focused leadership dedicated to growing a modern economy so we can make our community more attractive to move here and more affordable to stay here. This is Friedson’s core campaign message. Will it work? 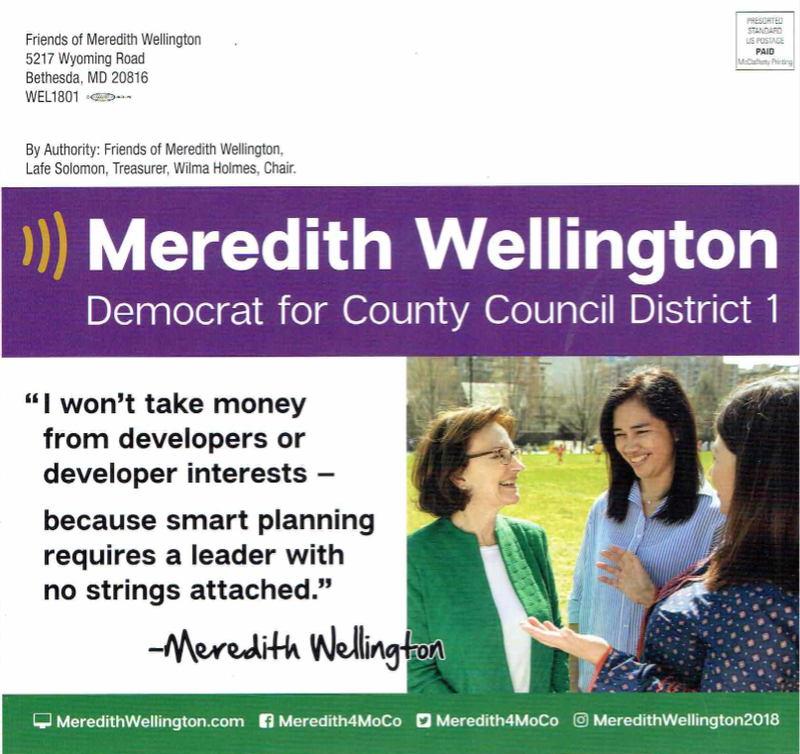 That’s the title of the mailer sent out by Council District 1 candidate Meredith Wellington this week, which we reprint below. 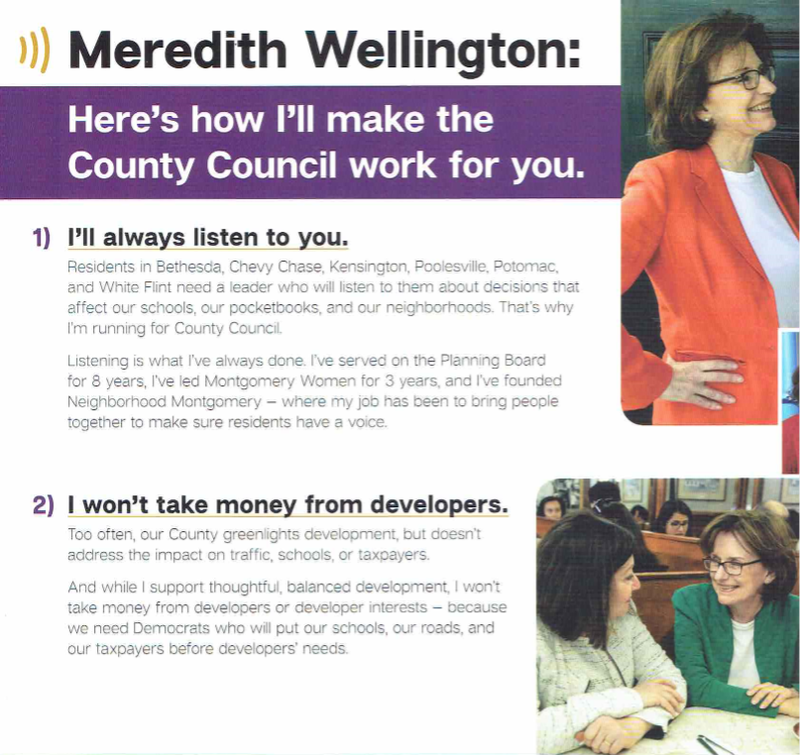 The remainder of Wellington’s message is clearly directed at opponents of development, an ancient political tradition in MoCo. But here is the thing: whether it’s fair or not – and we could make a case either way – pretty much everyone we talk to, regardless of their ideology, doesn’t believe the county adequately listens to them. That message, distilled of ideological connotation, will travel far and wide. SEIU Local 500, which represents MCPS support staff, adjunct college professors, child care employees and other members, has endorsed Delegate Ana Sol Gutierrez for the open Council District 1 seat. Gutierrez has also been endorsed by Progressive Maryland, Casa in Action and MCEA. Last week, she requested $10,290 in matching funds from the state under public financing, which – if she gets them – will give her over $30,000 in the bank. We reprint Local 500’s press release below. (Gaithersburg, MD) SEIU Local 500, the largest union local in Montgomery County, announced it was putting its full support behind Ana Sol Gutierrez for the Montgomery County Council District 1. The District 1 seat is open because incumbent Count Councilmember Roger Berliner is running for County Executive. “Ana has a strong background in education and understands the unique challenges and opportunities families face in Montgomery County. 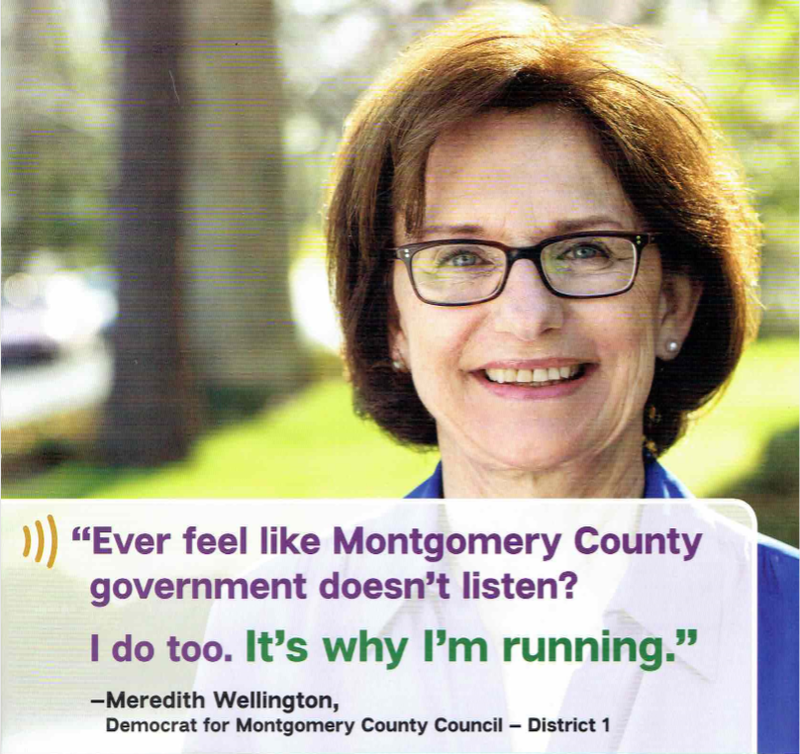 She has always been an advocate for those left behind in Montgomery County. She has been a leader on issues like affordable housing and working to close the achievement in our schools,” said Merle Cuttitta, President of SEIU Local 500. SEIU Local 500 represents over 20,000 workers across the region, including supporting services professionals in Montgomery County Public Schools, adjunct faculty at Montgomery College and Maryland family childcare providers. In addition to the wild and woolly Executive and Council At-Large races, MoCo has two competitive District County Council elections. Let’s have a look. In District 1, which stretches from Kensington in the east to Poolesville in the west, nine candidates are vying to succeed incumbent Roger Berliner, who is term limited and is running for Executive. But of these nine, only four look competitive at the moment and one stands out: former aide to the Comptroller Andrew Friedson. Friedson’s lead in total raised and cash balance is as obvious as it is staggering. But consider these three facts. First, if Friedson were running in the Council At-Large race, his total raised for the cycle ($218,903) would be second only to Hans Riemer ($219,103), who is the only at-large incumbent running. Friedson’s cash on hand ($200,622) would be second only to Delegate Charles Barkley ($232,428). Second, Friedson’s lead is not in money alone. We added up the number of individual contributors each of the top four fundraising candidates had in Bethesda, Chevy Chase, Potomac, Kensington, Cabin John, Glen Echo, Poolesville and zip codes 20852 (Rockville) and 20878 (Gaithersburg/North Potomac) to approximate in-district contributors. Friedson had 289 contributors in these locations, followed by Reggie Oldak (217), former Town of Kensington Mayor Pete Fosselman (195) and Meredith Wellington (92). Third, Friedson has accomplished this in just five months. Fosselman has been running for ten months, followed by Oldak (nine months) and Wellington (eight months). We wonder how much Friedson would have raised if he had been campaigning longer. The good news for Reggie Oldak is that she has done well in public financing and should have no problem hitting the $125,000 cap for public matching funds. The bad news is that it’s probably impossible for her to catch Friedson because once she hits the cap, she will be limited to $150 individual checks. Wellington has relied on self-financing more than the other candidates and has a high burn rate (41%). Fosselman should have been the fundraising leader in this race. He was Mayor of the Town of Kensington for a decade and is plugged into Ike Leggett’s network, the county developer network (he once worked for Rodgers Consulting) and what is left of the network of former Governor Martin O’Malley, who endorsed him and had his PAC max out to him. But Fosselman is fourth in cash on hand and faces the risk that the business community will turn to Friedson as a better prospect to win. In District 3, which is mostly comprised of Rockville, Gaithersburg, Aspen Hill, Leisure World, part of Norbeck and Washington Grove, former J Street Political Director Ben Shnider is taking on incumbent Council Member and former Gaithersburg Mayor Sidney Katz. Shnider, who is in the traditional financing system, outraised the incumbent, who is taking public financing. Shnider’s fundraising edge, along with his endorsement by SEIU Local 32BJ, gives his campaign credibility against Katz, who has been in county and municipal politics for decades. A further look at the fundraising numbers reveals two things. First, 76% of Shnider’s fundraising has come from out of state. (Katz’s percentage is just 2%). But second, and more worrisome for Katz, Shnider is starting to catch on in the district. When we added up the number of individual contributors from Rockville, Gaithersburg, Washington Grove and zip code 20906 (Leisure World/Norbeck) to approximate in-district contributors, Katz had 99 and Shnider had 75. Shnider is the underdog in this race, but Katz needs to start working harder to hold him off. The other districts lack competition. District 2 incumbent Craig Rice has not been raising money and is apparently unworried about his Republican rivals in the age of Trump. District 4 Council Member Nancy Navarro and District 5 Council Member Tom Hucker have no opponents and are headed to reelection. We will get to state legislative races soon, folks! Former Montgomery County Executive Doug Duncan has endorsed Council District 1 candidate Andrew Friedson. Following is Friedson’s press release. Bethesda, Md. 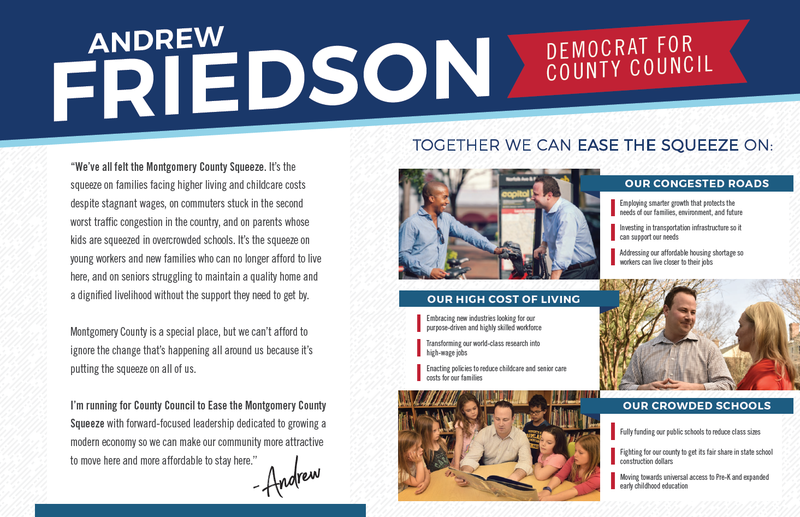 – Former Three-Term County Executive Douglas M. Duncan announced his endorsement of Andrew Friedson in the highly competitive Montgomery County Council, District One race. Following the endorsement, Mr. Duncan and his wife Barbara are hosting a birthday fundraiser on January 9th in Bethesda to support Friedson’s campaign, along with Comptroller Peter Franchot, Senators Brian Feldman and Craig Zucker, former Congressman C. Thomas McMillen, and former Maryland Democratic Party Chair, Susan Turnbull, in addition to a large host committee of well-known community leaders. Along with the endorsement of the former County Executive, Friedson’s campaign has been noted for its fast start and impressive following on social media since he formally filed for the seat on October 5. A lifelong Montgomery County resident and University of Maryland graduate, Friedson attended Wayside, Hoover and Churchill public schools. He spent the past six years as Senior Policy Advisor, Deputy Chief of Staff and Division Director for the Comptroller of Maryland where he focused on making government more effective, efficient and responsive, and previously oversaw a complete restructuring of Maryland’s $6 billion 529 college savings program. Friedson currently serves as Chair of the Montgomery County Collaboration Council for Children, Youth and Families, recently served on Maryland’s Small Business Development Financing Authority, and was a driving force behind a new state program which launched this fall to provide financial security and independence for Marylanders with disabilities. Duncan currently serves as President and CEO of Leadership Greater Washington. In addition to his decorated 12-year tenure as Montgomery County’s top elected official, he also co-founded a continuous advisory services firm for state and local governments, was Vice President for Administrative Affairs at the University of Maryland College Park, was a National Account Manager for AT&T, and served as Mayor of Rockville. For details on Andrew Friedson’s January 9th Birthday Bash, please visit http://ow.ly/k17t30h6GLW. 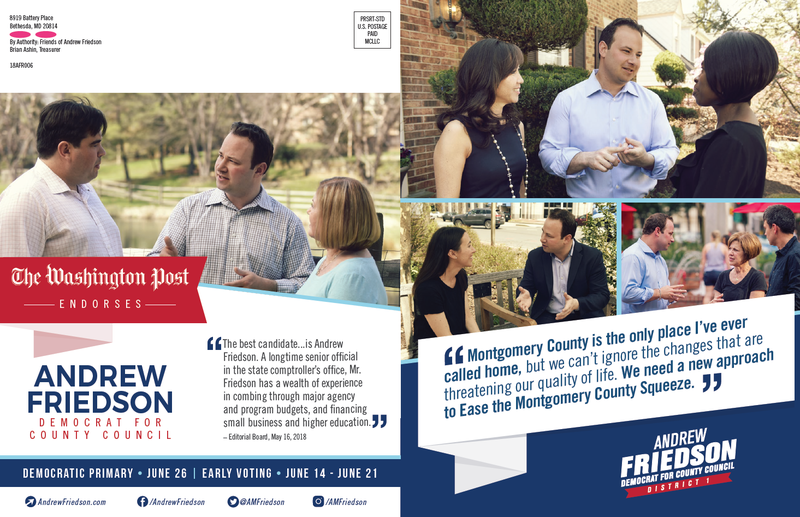 For more information on the Friedson campaign, please visit andrewfriedson.com or http://www.facebook.com/andrewfriedson. MCPS teacher and progressive at-large council candidate Chris Wilhelm has covered parts of Georgia Avenue and University Boulevard with his campaign signs. (It helps to speak Spanish!) Yes, we know signs don’t vote. But it shows that Wilhelm is working and that’s good for perceptions of his campaign. Who Has Momentum in Council District 1? Council District 1, which covers Bethesda, Chevy Chase, Potomac, Poolesville and a large part of Kensington, has more regularly voting Democrats and more political contributors than any other council district by far. It’s a prime seat. Right now, there are nine candidates in the race and there might be more on the way. Many good candidates in this district, like Bill Conway, Gabe Albornoz, Emily Shetty, Samir Paul and Sara Love, are instead running for council at-large or the General Assembly. There are lots of openings to choose from these days! So who has the momentum right now? You could say Delegate Ana Sol Gutierrez, who is the only sitting elected official who is running. Or Reggie Oldak, who has qualified for matching funds in public financing. 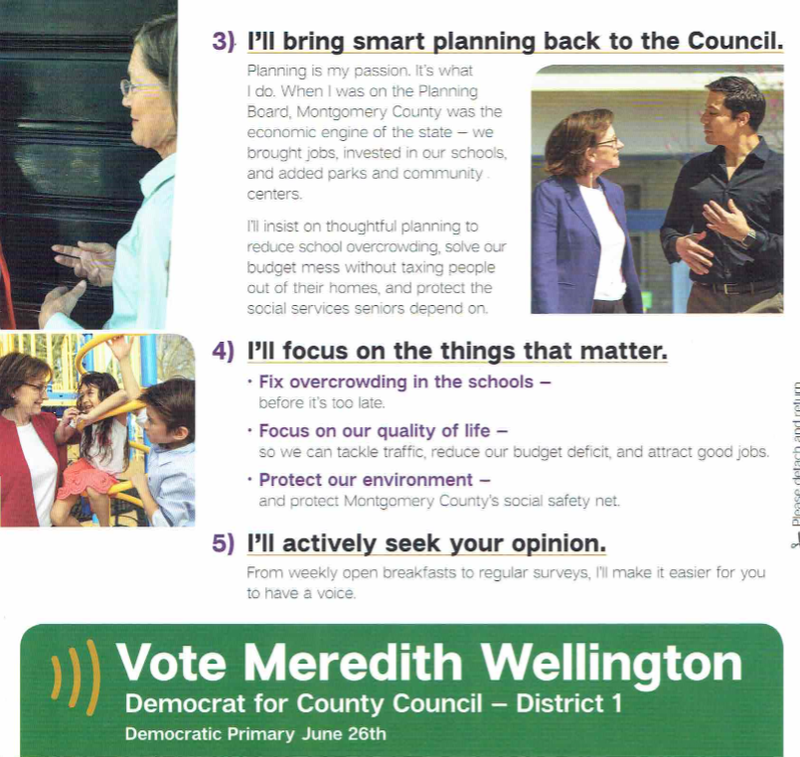 Former Planning Board Member Meredith Wellington should appeal to land use voters oriented towards Marc Elrich. Former Kensington Mayor Pete Fosselman was just endorsed by former Governor Martin O’Malley. But we’re going with Andrew Friedson, who just had his kickoff boasting endorsements from his former employer, Comptroller Peter Franchot, along with Senators Brian Feldman (D-15) and Craig Zucker (D-14) and former long-time DNC member Susan Turnbull. Feldman is an old hand in the Potomac portion of the district and has not been seriously challenged in 15 years. Turnbull doesn’t usually play in local races but she has a national network in both the Democratic Party and the Jewish community. If she is all in for Friedson, that’s a big deal. Friedson, who is killing the field in social media, is feeling pumped up right now with good reason. It’s unusual to see a large field of MoCo candidates without Duchy Trachtenberg among them. She has a long electoral history, losing a District 1 County Council race in 2002 by a hair, winning an at-large council seat in 2006, losing reelection in 2010, briefly running for Congressional District 6 in 2012 and getting annihilated in a challenge to District 1 council incumbent Roger Berliner in 2014. Now she has a full table of races to pick from, including council at-large, council District 1 and the District 16 General Assembly seats. Say what you will about Duchy – and we’ve said plenty – but she can raise money, she has a network and she has campaign experience. Is she done or is she just waiting to file at the last minute, as she has done before? Former County Council spokesman Neil Greenberger is torching his old bosses, saying they treat voters like ATMs and guaranteeing that if he is elected, there will be no property tax hikes. This is a new strategy for a Democratic council candidate made possible by the 2008 passage of the Ficker amendment, which requires votes from all nine Council Members to go over the property tax charter limit. Furthermore, it’s an unusual strategy from a historical perspective. Most council candidates over the last few decades have emphasized schools, transportation, development (pro or con) and a handful of other left-leaning issues but have not been explicitly anti-tax. That sentiment has mostly come from Republicans. But two things have changed in Greenberger’s favor. First, the passage of term limits was rooted partly in opposition to last year’s 9% property tax hike. But it wasn’t just the increase alone that annoyed residents. Unlike the 2010 energy tax hike, last year’s property tax increase was not driven by the catastrophic effects of a recession, but was a policy choice by the council that could easily have been much lower. Voters didn’t see the tax hike as truly necessary, which increased their frustration with it. That number may no longer hold. No one knows what the turnout will be next year; informed observers disagree about that. But the candidate field will be two to three times larger than in any other recent cycle and only one incumbent is running. That could mean a very fractured electorate yielding a low win threshold and tight margins. That favors candidates with medium-sized but intense bases, whether geographic, demographic or ideological. In Greenberger’s case, if 100,000 Democrats vote, and 30,000 of them are sick of tax hikes, and Greenberger can actually communicate with them, he could win. And so could anyone else who can put together 30,000 votes. Political handicapping is a very subjective exercise. That said, there are a handful of objective measures that give clues to the state of a race: fundraising, endorsements, surrogates, communications (like number of mailers sent and TV time purchased), and more. The jury is still out on the importance of social media followers. But if Facebook followings matter at all, Andrew Friedson is waaaaaay ahead on that measure in the Council District 1 election. As of Monday, September 11, here are the Facebook followers on each of the District 1 candidates’ campaign pages. That’s right, Friedson has almost six times as many followers as his competitors COMBINED. And they have all been running for months before he got in. One reason why Facebook followers are discounted by many is that they don’t reflect actual voters in the relevant jurisdiction. They can come from all over Planet Earth. So your author asked Friedson to provide a geographic distribution of his Facebook followers. According to data from his page, roughly two-thirds of Friedson’s followers reported cities of residence. Of those, 1,490 lived in Maryland, 971 lived in MoCo and 462 lived in the District 1 areas of Bethesda, North Bethesda, Potomac and Kensington. An additional 700 reported living in D.C., but some of those people could actually live in the Maryland suburbs. This is an impressive campaign page following for someone who just declared for the race a month ago. It reflects Friedson’s ability to tap into a number of networks, including his friends and family as a MoCo native; his college network from the University of Maryland (where he was a class President); his professional network from his time as an aide to Comptroller Peter Franchot and Congressional candidate David Trone; and his non-profit networks stemming from his service as a Board Member on the Jewish Council for Public Affairs and the MoCo Collaboration Council for Children, Youth and Families. These are real assets for any candidate for office. And Friedson can leverage them through social media to raise money, spread his message and build name recognition in a way the other candidates can’t (yet) match. Reggie Oldak has shown early success in the public campaign finance system but Andrew Friedson is off to a fast start. Let the rest of the field beware! Correction: The numbers for Hoan Dang in this post are inaccurate. 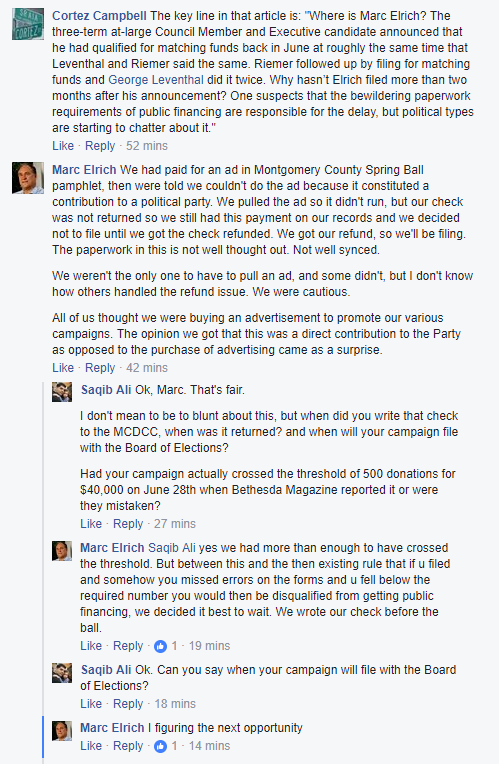 For updated numbers on Dang and a response by Marc Elrich, please visit our updated post. One of the virtues of public campaign financing is the rapid release of financial reports for participating candidates. That’s right, folks – for this group of candidates, there is no need to wait until January to see fundraising numbers. That’s because when they qualify for public matching funds and request them from the state, their financial reports are released almost immediately. This is terrific for all data junkies like your author as well as inquiring minds among the readers! Below is a summary for the five candidates who have applied to receive matching funds from the state. Bear in mind the following characteristics of the data. First, the number of qualifying contributors means the number of contributors who live in Montgomery County. Non-residents can contribute up to $150 each but the state will not authorize matching funds for them. Second, the individual contribution amounts are the basis on which the state determines how much in public matching funds will be released. Third, the date of cash balance is important because it varies depending on when the applications were sent in. That is unlike the regular reporting dates on which financial positions are summarized at the same time for all candidates. And fourth, for those candidates who have only filed once (which includes everyone except George Leventhal), the cash balances do not include public funds from the state. To estimate the cash positions of those candidates, the cash balance should be added to the public matching funds they requested. 1. Let’s start with the obvious: there are a lot of small checks out there! While many contributors are probably donating to more than one of these five campaigns, it’s not a stretch to say that close to a thousand people will have contributed by some point in the near future. It’s hard to make comparisons with the past without exquisitely detailed research to back it up (anyone want to pay us for that?) but our hunch is that this is a larger early donor pool than in prior cycles. 2. The big story here is Council At-Large candidate Hoan Dang. At-Large Council Members George Leventhal (who is running for Executive) and Hans Riemer (the only incumbent running for reelection) have a combined 22 years of representing the whole county. But Dang had more in-county contributors than either one of them! How does that happen? Dang ran for Delegate in District 19 in 2010. He was financially competitive, raising $103,418, but he finished fifth out of six candidates. There was no reason going into this race to believe that Dang would receive more grassroots financial support than Leventhal or Riemer. But so far, he has. 3. Dang is not the only story. Look at first-time candidate Bill Conway, who collected more private funds than Riemer primarily by having a larger average contribution. In most elections, challengers struggle to be financially competitive with incumbents. But the early performances of Conway and Dang relative to Riemer suggest that, at least among publicly-financed candidates, some or all of that gap may be closed. Our hunch is that a group of at-large candidates will all hit the public matching funds cap of $250,000 and therefore have similar budgets heading into mail season. The big question will then become how those totals compare to what candidates in the traditional system, like Marilyn Balcombe, Charlie Barkley, Ashwani Jain and Cherri Branson, will raise. 4. Where is Marc Elrich? The three-term at-large Council Member and Executive candidate announced that he had qualified for matching funds back in June at roughly the same time that Leventhal and Riemer said the same. Riemer followed up by filing for matching funds and Leventhal did it twice. Why hasn’t Elrich filed more than two months after his announcement? One suspects that the bewildering paperwork requirements of public financing are responsible for the delay, but political types are starting to chatter about it. That’s all for now. Candidates, keep those reports coming in so your favorite blog has more material for the readers!